The book describes a general vision of the miniaturization of the analytical systems, including their principles, designs and applications. Through ten chapters the different aspects characterizing the miniaturized systems are developed. 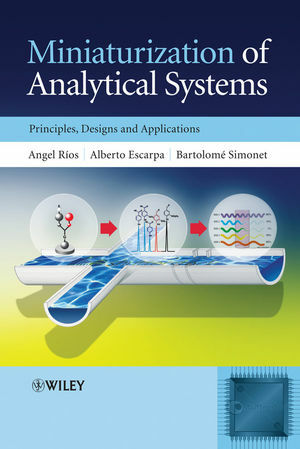 Thus, the two first chapters include the basic concepts behind miniaturization in analytical chemistry, as well as the mechanical and electronic tools needed for designing and fabricating miniaturized analytical systems. Chapters 3 to 6 represent the core of the book, as they take as the basis the analytical process and deal with the miniaturization of sample treatment (including the consequent automation), with sections devoted to the problems associated with sample introduction in micro(nano) systems; miniaturized systems for analyte separation, depending of the forces involved in moving the flow; and detection in micro-size environments. Following on, Chapters 7 and 8 will deal with the miniaturization of the entire process: from sample introduction to the generation of the corresponding analytical results. The last part of the book will deal with two aspects of miniaturized analytical systems directly connected to their usefulness: the design of portable miniaturized systems (interesting for performing field tests) and how to assure the practical reliability of the micro(nano) systems (quality control tests, performance and validation activities, as well as the robustness of the miniaturized depicted systems. The ruggedness of micro(nano) systems are briefly discussed and related to the tools for designing and fabricating described in the first chapters of the book. Angel Rios is Professor of Analytical Chemistry and the University of Castilla-La Mancha in Spain. Dr Alberto Escarpa, Univeristy of Alcals, Alcala de Henares, Spain. Dr Bartolomoe M Simonet, University of the Balearic Islands, Spain. 1 Miniaturization in Analytical Chemistry. 1.2 Miniaturization as One of the Critical Trends in Modern Analytical Chemistry. 1.3 Evolution in the Field of Analytical Miniaturization. 1.4 Classification of Miniaturized Analytical Systems and Definition of Terms. 1.6 Features of Miniaturized Analytical Systems. 1.7 Incidences of Miniaturization in the Analytical Process. 2 Tools for the Design of Miniaturized Analytical Systems. 2.2 Miniaturized Analytical Processes: The Downsizing and Integrating Phenomena. 3 Automation and Miniaturization of Sample Treatment. 3.2 Simplification of Sample Treatment: Microextraction Techniques. 3.3 Simplification of Sample Treatment: Continuous Flow Systems. 4 Miniaturized Systems for Analytical Separations I: Systems Based on a Hydrodynamic Flow. 4.2 The Earliest Example of Miniaturization of a Gas Chromatograph and Some Other Developments. 4.3 Capillary Liquid Chromatography (CLC). 4.4 Liquid Chromatography on Microchips. 5 Miniaturized Systems for Analytical Separations II: Systems Based on Electroosmotic Flow (EOF). 5.2 CE on the Microchip Format. 5.3 Modes and Theories of CE Microchips. 5.5 Basic Fluidic Manipulation/Motivation: Electrokinetic Injection and Separation Protocols. 5.6 Electrochromatography in Microchip Format: Designs and Applications. 5.7 Comparison of Hydrodynamic and Electroosmotic Flow-driven Miniaturized Systems. 6 Detection in Miniaturized Analytical Systems. 6.2 Laser-induced Fluorescence (LIF) Detection. 7 Miniaturization of the Entire Analytical Process I: Micro(nano)sensors. 7.2 Evolution of Sensors with Nanotechnology. 7.4 Nanoprobes for In Vivo Bioanalysis. 8 Miniaturization of the Entire Analytical Process II: Micro Total Analysis Systems (μTAS). 8.1μTAS, Microfluidics and Lab-on-a-Chip: Concepts and Terminology. 8.2 Basic Concepts of Microfluidics: The Design of Analytical Microsystems. 8.3 The Basics of Downscaling in Microsystems. 8.4 Microfluidic Platforms: Types, Principles and Classification. 8.5 Microfluidic Devices for Analytical Lab-on-a-Chip Applications. 9 Portability of Miniaturized Analytical Systems. 10 Analytical Performance of Miniaturized Analytical Systems. 10.2 Quality Control in Miniaturized Systems.